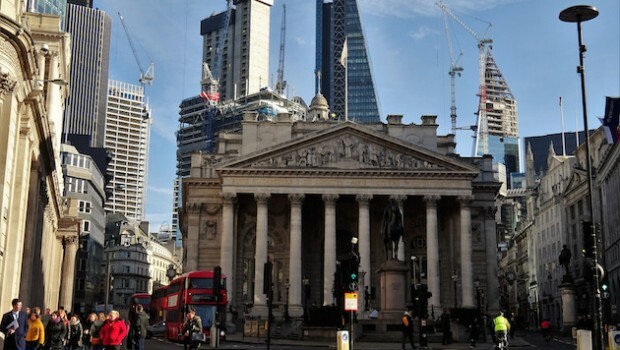 London stocks had nudged a touch higher by midday on Monday, but the upside was capped by a weak mining sector, as investors eyed more key US earnings later in the session and important UK and Chinese data due later in the week. The FTSE 100 was 0.1% higher at 7,442.92, while the pound was up 0.2% against the dollar at 1.3101 and 0.1% stronger versus the euro at 1.1584, underpinned by comments from Foreign Secretary Jeremy Hunt, who said on a visit to Japan that talks with Labour - which are set to continue over the Easter recess - had been "more constructive than people thought". In addition, first-quarter earnings from Goldman Sachs and Citigroup were due ahead of the US opening bell following impressive numbers from JPMorgan Chase and Wells Fargo on Friday. London Capital Group analyst Jasper Lawler said: "After a tough couple of months, economic data and corporate updates are finally providing some ray of light. However, it's questionable whether this can last. Traders will be keeping a close eye on where US earning season goes from here. "A good run from the banks is half expected given the US rate rises that we have seen last year. Whether the strong start is able to continue beyond the banking sector will be key; right now this is looking unlikely." Meanwhile, Sino-US relations were in focus again after US Treasury Secretary Steve Mnuchin said over the weekend that he was hopeful talks between the two would soon come to a close. According to Reuters, Mnuchin said on Saturday that a deal between the two nations would go "way beyond" previous agreements and that the two sides were “close to the final round” of negotiations".